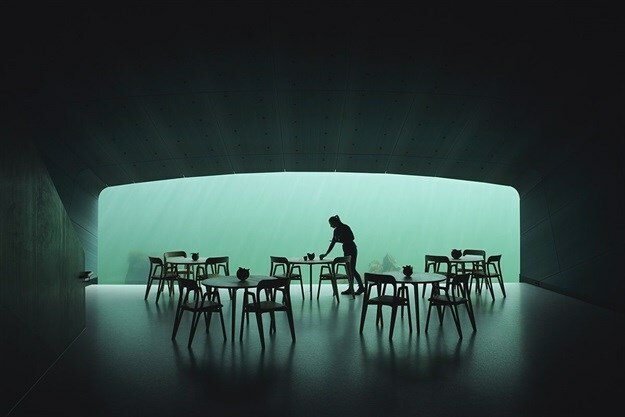 Snøhetta's half-sunken restaurant has officially been opened to the public and the building will welcome its first guests in Lindesnes, Norway with its monolithic form and special interior overlooking the marine life. 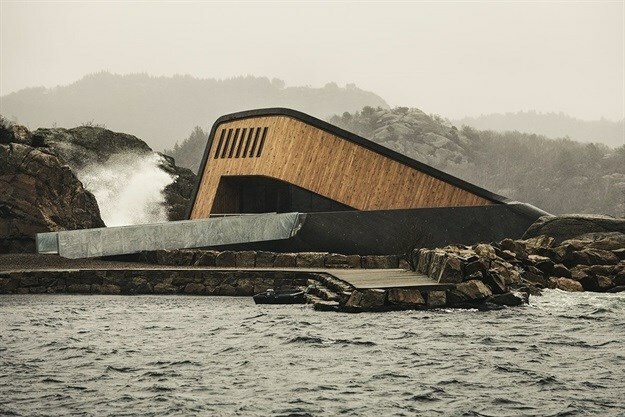 The 34-metre long monolithic building is Europe’s first underwater restaurant located at the southernmost point of the Norwegian coastline, where the sea storms from the north and south meet; the project is situated at a unique confluence. Called Under, the building has the dual meaning of "below" and "wonder". As it can be seen from the water, the building's form breaks the surface of the water to rest directly on the seabed five metres below. The structure is designed to fully integrate into its marine environment over time, as the roughness of the concrete shell will function as an artificial reef, welcoming limpets and kelp to inhabit it. 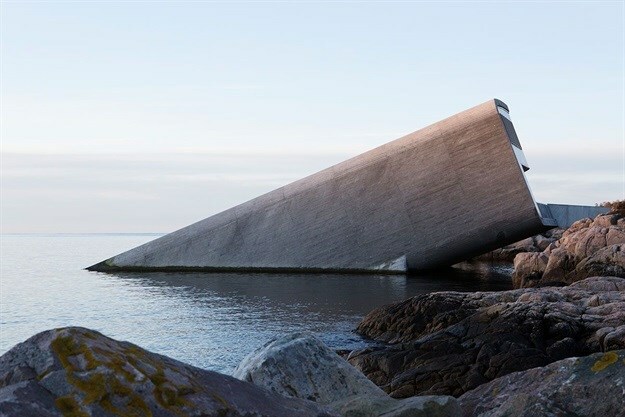 With the thick concrete walls lying against the craggy shoreline, the structure is built to withstand pressure and shock from the rugged sea conditions. The restaurant seats 35-40 dinner guests every night in a dining room protected by half a metre-thick concrete walls. Its culinary focus is to create a fine dining experience based on high quality, locally-sourced produce, with a special emphasis on sustainable wildlife capture. Danish expatriate Nicolai Ellitsgaard from acclaimed restaurant Måltid in Kristiansand is the head chef, bringing an international, 16-person kitchen team with experience from top Michelin restaurants. "Under is a natural progression of our experimentation with boundaries," said Snøhetta founder and architect, Kjetil Trædal Thorsen. 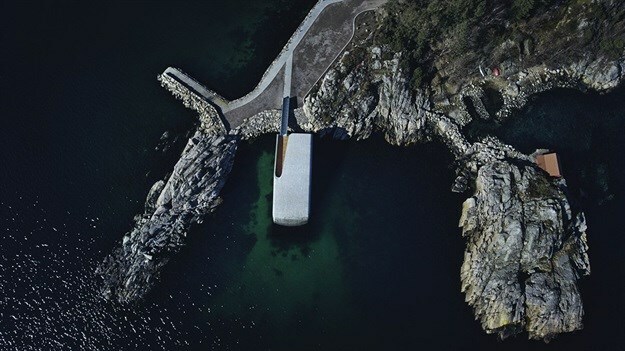 "As a new landmark for Southern Norway, Under proposes unexpected combinations of pronouns and prepositions, and challenges what determines a person’s physical placement in their environment. In this building, you may find yourself under water, over the seabed, between land and sea. This will offer you new perspectives and ways of seeing the world, both beyond and beneath the waterline." The rich interiors create a warm, welcoming atmosphere inside the restaurant. As a metaphor for the journey of descending from land to sea, textile-clad ceiling panels reference the colours of a sunset dropping into the ocean, accompanying one’s passage down the stairs. The subtle elegance of the finely woven ceiling panels lends a serene ambience to the building. At the seabed, five metres below sea level, lies the panoramic eye of the building. An eleven-metre-wide and 3.4-metre-tall horizontal window offers a visual gateway to the sea and connects the guests to the wildlife outside. An equally important part of the project is the building’s facilitation of marine research. The restaurant will welcome interdisciplinary research teams studying marine biology and fish behaviour, through cameras and other measurement tools that are installed on and outside the facade of the restaurant. The researchers’ aim is to document the population, behaviour and diversity of species that are living around the restaurant, through cameras and live observation. The goal of the research is to collect data that can be programmed into machine learning tools that monitor the population dynamics of key marine species on a regular basis, thereby creating new opportunities to improve official marine resource management.